It took the jury just over two hours to find Reginald Potts, Jr., guilty of the first degree murder of Nailah Franklin. Illinois no longer has the death penalty, but he is unlikely to ever walk free. He had eight previous convictions and warrants for $40,000 in outstanding child support by the time he was 31. He had recently been paroled when he met and wooed Nailah Franklin. When she found out about his past, and about the child he'd fathered while seeing her, she severed the relationship. Women did not dump Reginald Potts, Jr. When she broke up with him, their relationship changed from boyfriend and girlfriend to, in the words of the prosecutor, "hunter and hunted." Long ago I loved a man like that. He still resurfaces in my life from time to time and still has the power to scare and upset me. We all make mistakes. 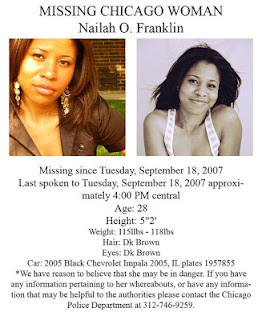 It breaks my heart that Nailah Franklin had to die over hers. 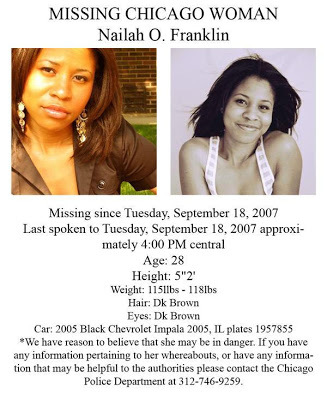 Her case has resonated with me since she went missing, that warm autumn of 2007. She had recently worked at Leo Burnett, an advertising agency just up the street from mine. Her former coworkers, who clearly adored her, were leafleting at my el stop and pressed one of these into my hand. Throughout my neighborhood, her face looked out at me from store windows. First her car was found, abandoned and empty and wiped clean. I had hoped that perhaps it was a carjacking gone hideously wrong. Then her body was found in an Indiana lot, beside the video store* which just so happened to be run by the brother-in-law of Reginald Potts, Jr. I hope that her family can find some measure of peace. They have suffered a great deal and lost a great deal more. They are in my prayers. *When is the last time you saw a video store? That's how long this case has dragged on.